With the realized benefits of decreased post-operative pain, a shorter hospital stay, and a faster recovery time when compared to open surgery, enthusiasm for minimally invasive esophagectomy has increased worldwide. Several groups use lateral decubitus positioning for thoracoscopic mobilization of the esophagus, while some have suggested that prone positioning may minimize the number of technical and ergonomic challenges associated with the lateral approach. We have started a minimally invasive esophagectomy program using a technique that utilizes prone positioning for esophageal mobilization prior to laparoscopic gastric mobilzation and an open cervical anastomosis. Methods: Two minimally invasive esophagectomies and one minimally invasive epiphrenic diverticulectomy and myotomy were performed between June 2007 and September 2007. The second esophagectomy was performed on a Stage IIb patient receiving neoadjuvant chemotherapy and radiation treatments to the distal esophagus who additionally required a reoperative hiatal dissection. Results: Mean thoracoscopy time and total procedure times were 131 and 251 minutes respectively. Mean estimated blood loss during thoracoscopy was 50 mL. The average number of lymph nodes removed per procedure was 11. There have been no open conversions, no deaths and no anastomotic leaks. Early morbidity includes two left sided pleural effusions. 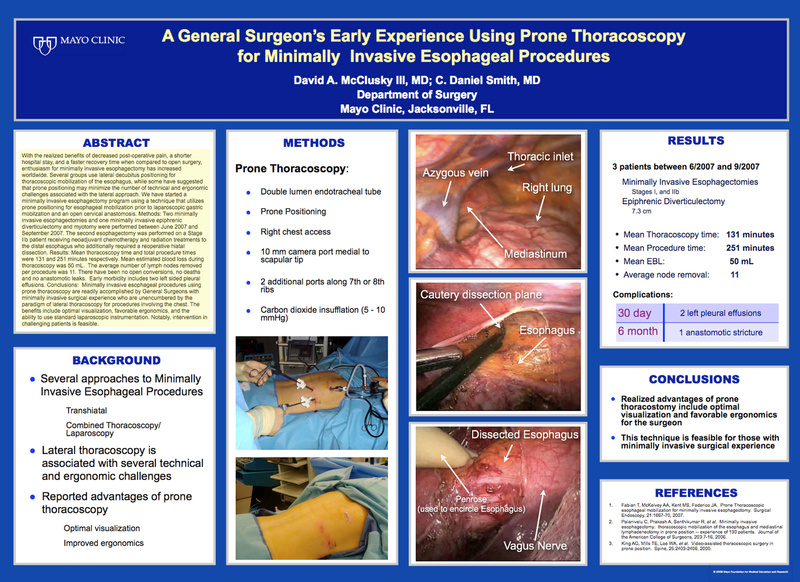 Conclusions: Minimally invasive esophageal procedures using prone thoracoscopy are readily accomplished by General Surgeons with minimally invasive surgical experience who are unencumbered by the paradigm of lateral thoracoscopy for procedures involving the chest. The benefits include optimal visualization, favorable ergonomics, and the ability to use standard laparoscopic instrumentation. Notably, intervention in challenging patients is feasible.